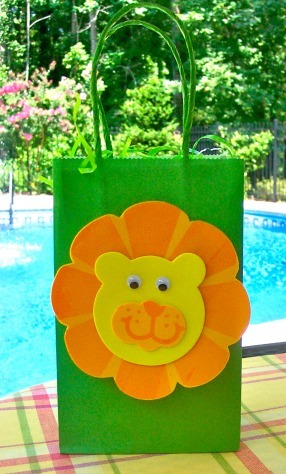 Take a Lion's Leap into the deep with a jungle birthday party theme. Why wait for someone's birthday? 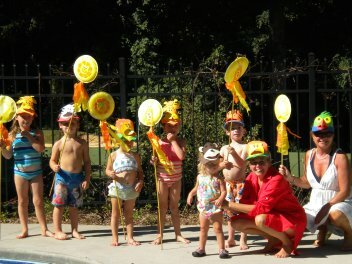 A jungle party theme is a great idea for your next pool party. With brightly colored parrots, lions, tigers and giraffes, there is lots to creative ways to use these animals for your invitations, games, and party favors. 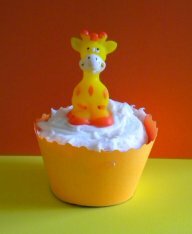 Decorate your cake or cupcake with safari animals and use the cake as your centerpiece. Find hippo swim rings for your pool games or use them as decorations. Go on Safari searching for wild animals that are hiding among the landscaping or as a dive game in the swimming pool. Jungle party invitations can be purchased on-line or they can be easily made with some card stock and stickers. "Looking for a roaring good time?" "Want to Hang with the Monkeys?" "Join us for a safari surprise." Jungle party decorations begin at the arbor before the pool gate. Hang brightly colored snakes, frogs or lizards from the arbor or vine to greet your guests. I always decorate the pool gate as well with just inexpensive decorations from our local Dollar Store. This year I hung a brightly colored parrot mask with snakes hanging on either side. The snakes were purchased at Target. 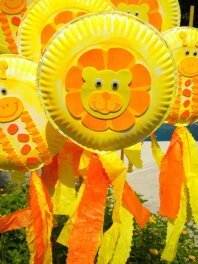 These cute yellow and orange lions were made from two paper plates, a craft kit from Oriental Trading, a painted dowel and some crepe paper for streamers. Jungle party supplies can be purchased at your local dollar store or on line - my favorite, cheap place is Oriental Trading. It saves a lot of time running around town. 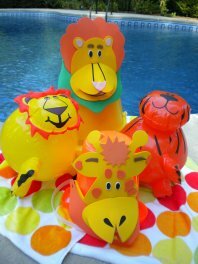 In fact this safari animal foam craft kit from Oriental Trading was used for all the party bags. Quick and easy, the bags were placed around the umbrella pole of the patio table with lots of green Easter grass underneath. Start with dark green or lime green plates and cups using a jungle themed tablecloth. The jungle cake or party bags can be used as your centerpiece. Use wild animal figurines or finger puppets to top your cake for a jungle birthday cake. Party favor ideas that appeal to boys and girls are temporary tattoos, plastic snakes, animal erasers or pens and animal print snap bracelets. 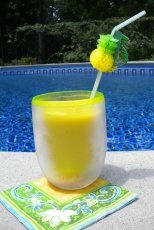 For more party supply ideas check out the Jungle Party Store. Jungle party games need to be age appropriate. We played the parrot race with kids age 3 - 6 years old. A parrot mask was wrapped around a noodle - one for each player. The two players raced across the pool to the other side. Send kids off on a "safari" scavenger hunt looking for "clues" of wild animals. Or in the case of a pool party a Safari Dive. Buy hard plastic wild animals and drop them into the pool. Have the guests dive for them. See how many they can find in one breath. Or as each player is taking their turn, instruct them that they need to just find the lion or the zebra. Why not play Monkey in the Middle? Using a beach ball and 3 players. One player is in the middle. The other two players try to toss the beach to each other without "the monkey" getting it. When "the monkey" catches the ball, the player who tossed it goes in the middle. Simply purchase plastic safari animals and place them on top of your homemade or store bought cake. 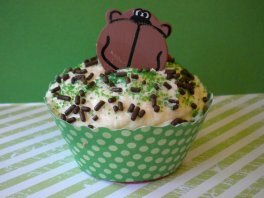 Instead of making a cake, make cupcakes and sprinkle green sugar on the frosting and place a plastic animal on the top as a little party favor. This cupcake has a green and white polka dot cupcake wrapper that I cut from cardstock paper. See how cute Mr. Giraffe looks sitting on the white frosting and surrounded by a colorful cupcake wrapper? Display your cupcakes in a cupcake tower and now you have a jungle party centerpiece too! 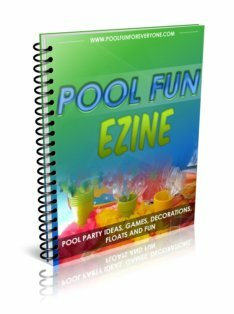 Start planning and use these jungle party ideas to host your swingin' from the tree tops pool party.